Following the abundance we enjoyed on Thanksgiving Day followed by shopping sprees on Black Friday, small business Saturday, and Cyber Monday, we are reminded that we are indeed very blessed with great prosperity in America. However, as I read the little letter of 3rd John this morning I was struck by the thought that God does care about our physical and material prosperity. To his friend Gaius, John penned, “Beloved, I pray that you may prosper in all things and be in health, just as your soul prospers” (3 John 2). The wording of John’s expression for Gaius’ prosperity is unusual. He prays that he may enjoy physical health and material gain just as much as his soul prospers. Most people get that reversed. We’re concerned about good health. We’re constantly reminded by the media of the need for proper sleep, regular exercise, and a healthy diet. And don’t forget to take your vitamins. The slew of success books on the market all speak to some common themes if you want to prosper. Be positive. Set goals. Work hard. Dream big. Be persistent. Invest wisely. And live on less than you earn. However, what about spiritual prosperity? Who’s talking about that? Who’s doing a year-end assessment of their spiritual worth? Who’s taking a spiritual inventory? Furthermore, how healthy would you be if your physical condition was in direct proportion to your spiritual shape? 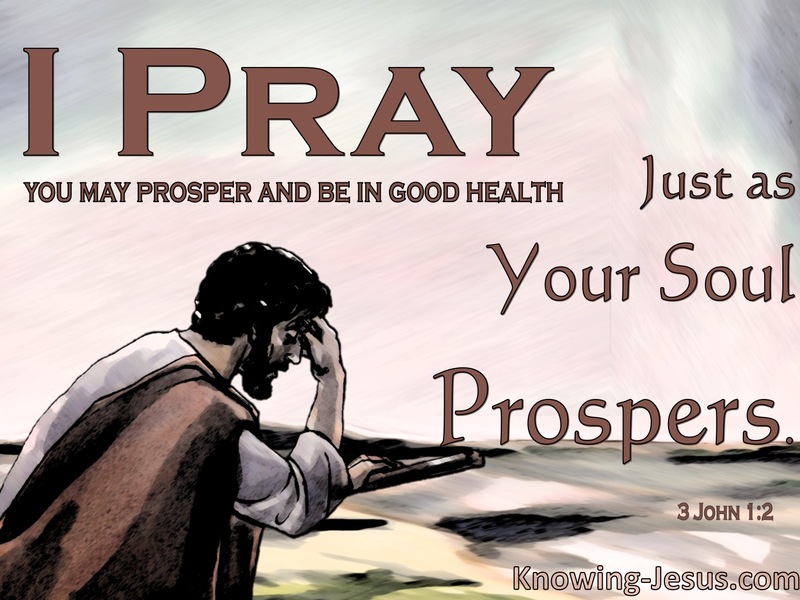 How wealthy would you be if your material prosperity directly mirrored your spiritual prosperity? Just like good physical health and material success are dependant upon specific, predetermined steps, so also is our spiritual health. Consider a few factors to spiritual prosperity. The Bible is filled with examples of great men and women who were spiritual giants. They walked with God. Overcame the odds. Defeated the enemy. And they serve to motivate and inspire us. Abel. Enoch. Abraham. Joseph. Moses. And Joshua. The one common denominator was their faith (Heb 11). Faith, however, doesn’t just happen. It takes focus. Effort. And a heart tuned to listen to the Lord. That means a constant, steady diet of Bible reading. “So then faith comes by hearing, and hearing by the word of God” (Rom. 10:17). Faith becomes misplaced or shallow when we listen to the wrong people and spend more time reading the wrong books than we do hearing God speak through his Word. We sing about the “Sweet hour of prayer.” We preach about prayer. We study and debate its merits. But do we really pray as we should? Despite the brevity and busyness of Jesus’ earthly ministry, he took time to pray to the Father. He taught his disciples how to pray. And urged us to “always pray and not lose heart” (Lk 18:1). The two great commandments speak to our wholehearted love for God and for our fellow man. Jesus said, “On these two commandments hang all of the law and the prophets” (Matt 22:40). God is love. And the ultimate expression of His love was demonstrated in sending Jesus Christ to earth. Jesus called on his followers “to love one another.” Love is not some abstract idea. But it is personal. Practical. And action oriented. It is necessary for spiritual wellness. What blood is to our physical well being, love is to our spiritual health. The hallmark trait of Biblical heroes was their endurance. Steadfastness. And constancy of faith (Heb. 10:38-39). This means overcoming trials, tribulations and temptations. Satan wants you to compromise. To quit. To throw in the towel. To say, “It’s too hard. I can’t do it.” Don’t give up. Don’t give in. Don’t give out. How’s your spiritual health? Are your prospering? great thoughts/lesson here , brother!! thanks! If we practice Matt. 6:33, our souls will prosper and then our needs will follow. Thanks Ken.